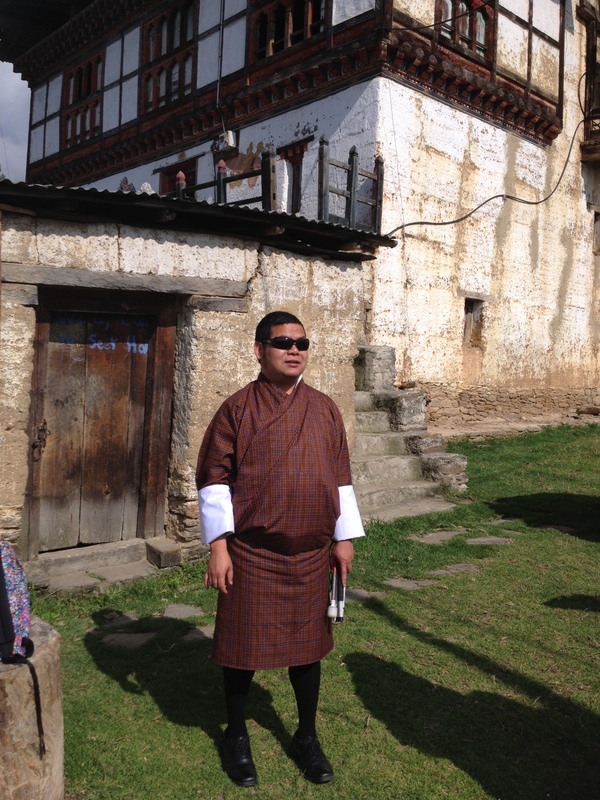 On the evening of 19th May 2017, I was invited to join a team of staff from the Disabled Persons’ Association of Bhutan (DPAB) to go to Wangdue Phodrang for a disability awareness program which was to be held over the weekends. The cool Friday evening breeze rejuvenated us as we eased our way through the mountains and valleys towards Wangdue Phodrang. 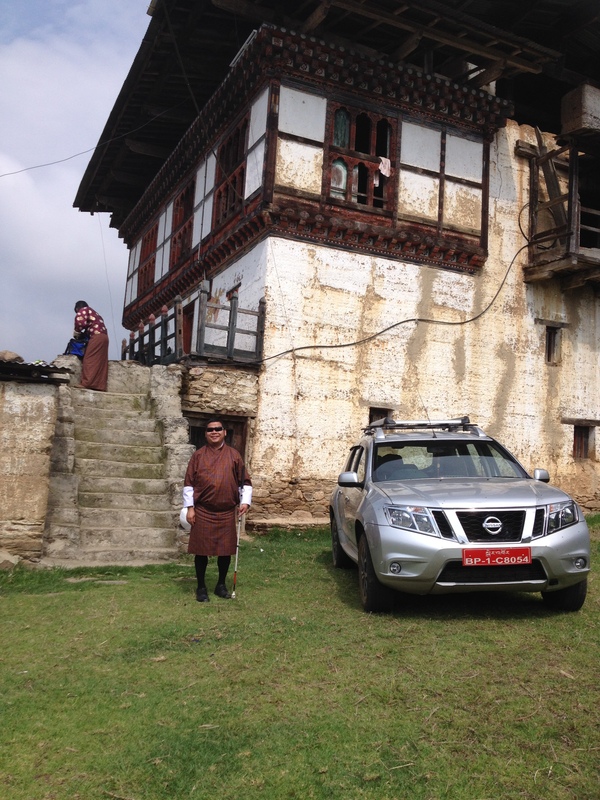 It was about 8 o’clock in the evening when we reached the ancestral home of Sonam Deki, our team leader. We were to stay in this house until Sunday. Standing majestically on the edge of Phangyul Gewog, the two-storied house of Angay Kesang could be one of the oldest houses in Bhutan. The moment I started climbing up the old traditionally-built wooden stairs, I could feel its rich history hidden beneath. The stairs are so steep that I felt as though I was visiting some ancient Buddhist temples and Dzongs. Entering this house was like entering into the past. The ground-floor that was used as a shed for cattle and the toilet on the top-floor that fed the pigs directly below are still preserved to retain the old tradition although the pigs and cattle are no longer kept in the house. The wooden frameworks across the windows, the architectural design and the painting on the walls speak about the 18th and 19th century Bhutan. As I explored more about this house, I became more curious about its history. But nobody knows exactly when it was built. “Even my 87-year-old mother does not know when this house was built”, Sonam Deki told me. Although there is no record to show when this house was built, it has definitely outlived so many generations of occupants. One thing we could clearly understand is that this house definitely belonged to a noble family. Around the edge of its surroundings, we can still see the ruins of sheds and huts used by serfs working for this particular family. 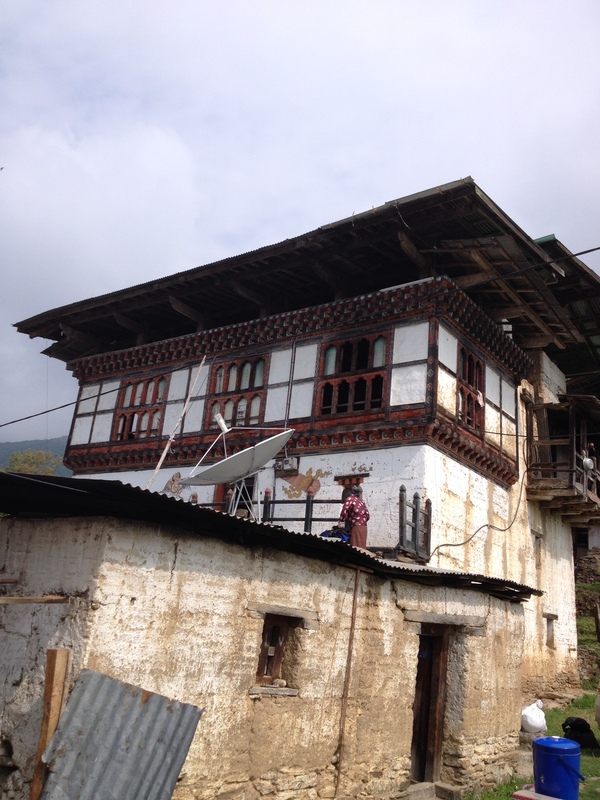 This house has definitely lived through the age of serfdom in Bhutan, during which the landlords could afford to keep slaves to work for them. It was only after His Majesty the Third Druk Gyalpo, Jigme Dorji Wangchuck abolished serfdom in 1960s that the serfs moved to a nearby village and started their own life. “I am the only one not raised by a serf” Sonam Deki says. “All my elder siblings were babysat by serfs” she adds. So this house definitely has a rich history interwoven with time and space. It connects the present generation to that of the past. I have been told that there are many items in this house that were used during the ancient times and that some people are even trying to buy them. “In the future, I wish to convert this house into a museum” Sonam Deki’s husband, Tsagay said, appreciating the historical value of this legendary house. Many people believe that this house is more than 100 years old. It could have even witnessed the era of Pemi Tshewang Tashi, the legendary warrior of Wangdue Phodrang in the 19th century whose ruined house lies at a close distance. Surrounded by vast paddy fields, gardens and forests, the house still looks so magical and heavenly. The beauty of natural landscapes lights up the entire community and gives everybody a reason to smile everyday. In the midst of busy urban life today, this house provides a perfect place to repose for a while. It really takes you back to the past, back to your childhood in the village. The house has several spacious rooms and all the boys were put up in one room overlooking the fields below. As my friends fell asleep, I remained awake exploring the surroundings through the window. The seasonal crickets chirping in the bushes, the dogs barking in the neighborhood and some familiar sounds in the nearby forests brought the memories of my rustic childhood days back to life. For the first time in decades, I was very excited to hear jackals howling in the distance in the middle of the night. I had thought that these creatures might have become extinct since it has become extremely rare to see them or hear them today probably due to the continuous destruction of natural habitats by human beings. As the night progressed, I gradually drifted into sleep drowning in the beauty and peace of the absolutely natural village life. I felt truly blest. In the morning, we were warmly greeted by members of the family in the house as we walked out to wash our face. The kind of hospitality we enjoyed during our short stay in the house made me realize that the human values that are fast fading in other cultures are still intact in this particular community. I wish if I had the resources to get to the bottom of the history of this house and revisit the time it has passed through so far. I am sure it carries stories that can keep the world spellbound.